The Disney Dream will be in dry dock October 4 – 24, 2015. And there are some major changes coming! Out of this world news for Star Wars fans… The Disney Dream is transforming part of the Oceaneer's Club/Lab into the Millenium Falcon! 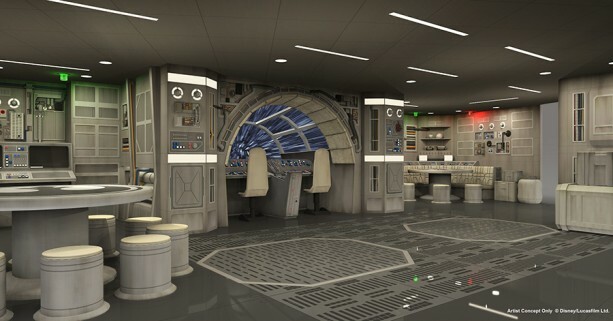 The new Star Wars:Millenium Falcon area will feature interactive elements allowing youg Padawans to "pilot" the ship, as well as partake in Star Wars-themed games, crafts, and activities. There will also be an onboard version of the Jedi Training Academy! Another new area will be the Disney Infinity Toy Box. This area, based on a Disney Infinity video game, will feature customized on-screen adventures and allow kids to unlock exclusive content that they can continue to enjoy at home! Kids will stand on a life-sized base that lights up in response to the game. Kids can actually become part of the game!